“The Journey” is a way of helping to heal your life and set yourself free from the results of thought patterns that have been causing stress, tension, pain or dis-ease. These thought patterns will have been created from a past experiences and the memories of them still held in the body and affecting everyday life. 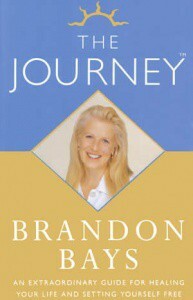 After being diagnosed with a football-sized tumour, experiencing her own personal journey of healing which led to a complete healing, Brandon Bays writes her story in a book named, “The Journey.” I highly recommend this book as a resource for people who wish to experience “The Journey Process”. Journey sessions can be deeply transformative and have set thousands of people free from lifelong emotional and physical blocks. It can guide a person directly to the root cause of longstanding difficulties and then give them the tools to heal it completely. The changes that result in the mind and the body produce lasting results. Journey sessions have the potential to powerfully heal and transform particular areas of your life, e.g. physical health, relationships, grief and trauma etc. A journey session is guided by your own body wisdom and will allow you to let go of what you are ready to let go of. As most of us require healing in many different aspects of our lives and healing may be done in layers to protect the body and mind, it may require a series of sessions to achieve it. A decision that recognises that something in your life needs to be healed. It might be that something needs to change, something needs to be different or something needs to improve. Once you have made the decision to heal, I am here to support it by introducing you to Transformational Emotional and Cellular Level Healing in the Mind and Body (the experience of it). It is done by transforming the informational content in your body and mind. My involvement is of the nature of guide, coach, facilitator, supporter and teacher and it is in this function I specialise in. I do my best to create a safe and supportive environment to support you. No words can really describe how it works. The only way for you to really get to know it … is in the experience itself. This book can be purchased from Amazon.com and in most major book stores and is often available at public libraries. The Journey was a mind blowing experience. I have always found it hard to get in touch with my emotions in a normal therapy. During the journey, Peter guided me into such a relaxed state of mind that I felt that I elevated up from my body.Peter was 100 percent present during my journey and I could trust him. Little by little I got to the state of mind where I could feel emotions again which were suppressed for years. I don’t know If I have ever felt so present in my life.After two hours I felt that the journey had lasted for six hours. I felt reborn and walked 100 metres barefoot to the beach and stared at the sea and celebrated my new self. I wanted to have a concrete memory of that journey, so we bought a big jar that I filled with sand. This sand symbolised my new self-value which is now stable and always stays with me. After getting in touch with my suppressed emotions I’m ready to continue my journey by myself. Thanks once again for supporting my healing and personal transformation.